The design for the Newton Master Suite Renovation by Andrew Watkins of Design-Lab responds to three primary desires by the client, a plan that allows for multiple scenarios of hosting overnight guests, the expansion of a master bath that includes a private bathing room, and a fostering of the client’s large art and book collections. The renovation encompasses the second floor of a three-story turn of the century Victorian. To maximize the efficiency of the plan, a flexible system of panels was inserted into the static Victorian layout, allowing the clients to reconfigure the floor, as they need. 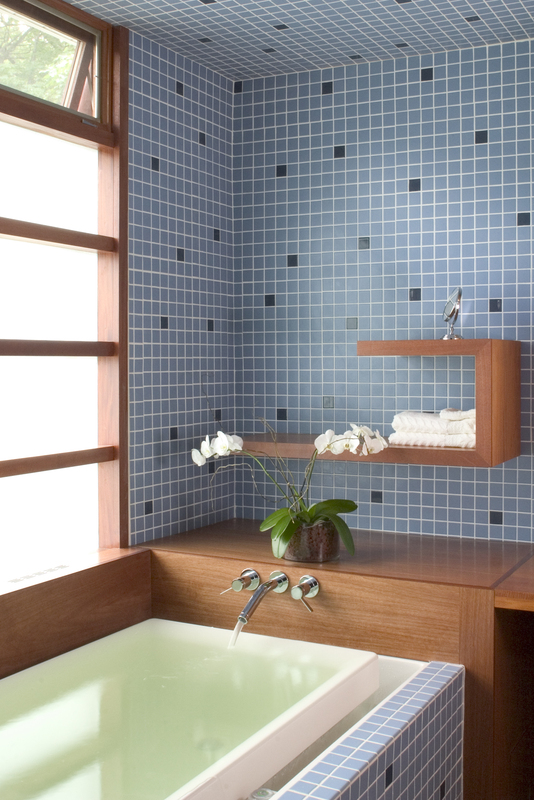 The bathroom was redesigned to allow a more pleasurable bathing experience while still allowing a division of privacy. This master suite renovation makes the most of a small 900 square foot floor plate, allowing many different spatial configurations within one plan. The flexible panel system allows for a multitude of plan options. 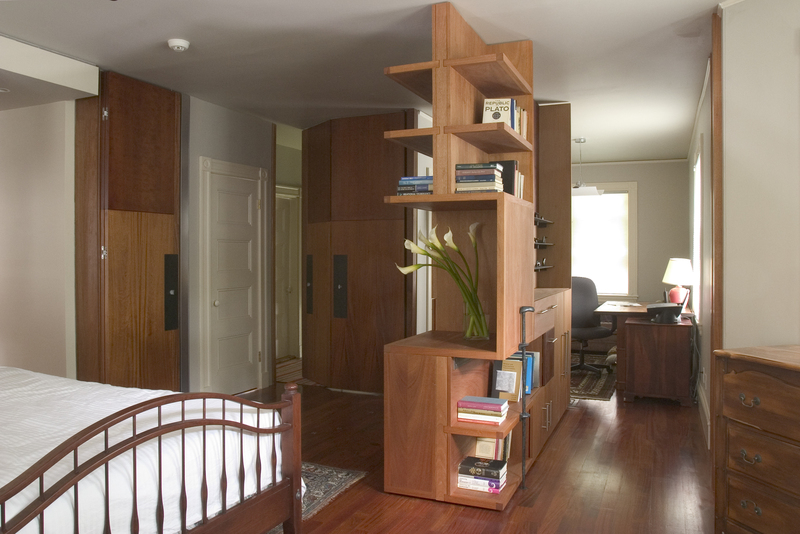 The mahogany and cherry panel system acts as a division between the main entry hall from the stairs, the office/guest room, the bathroom and the master bedroom. By reconfiguring four panels and a bookshelf, the spatial connections between these four elements completely change. The suite may be very open to the rest of the house or completely closed off to it, the office may be private to the master bedroom or there may be a continuation of space from one to the other. 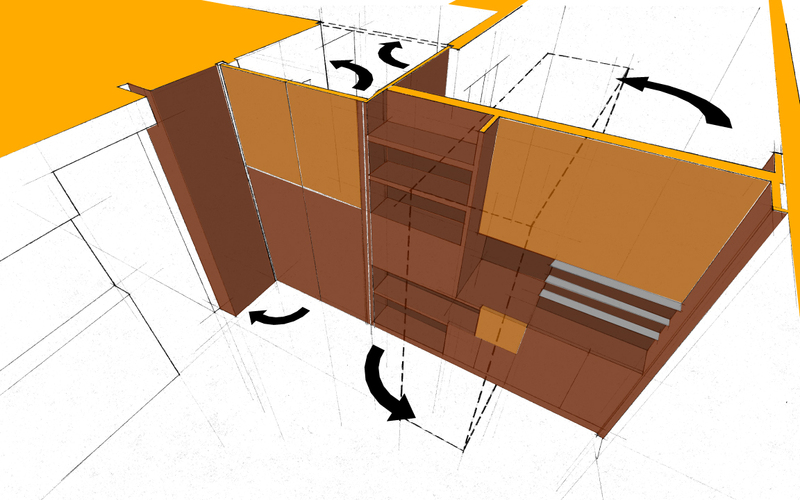 Each configuration responds to the currant occupants and how the clients desire to use the space. 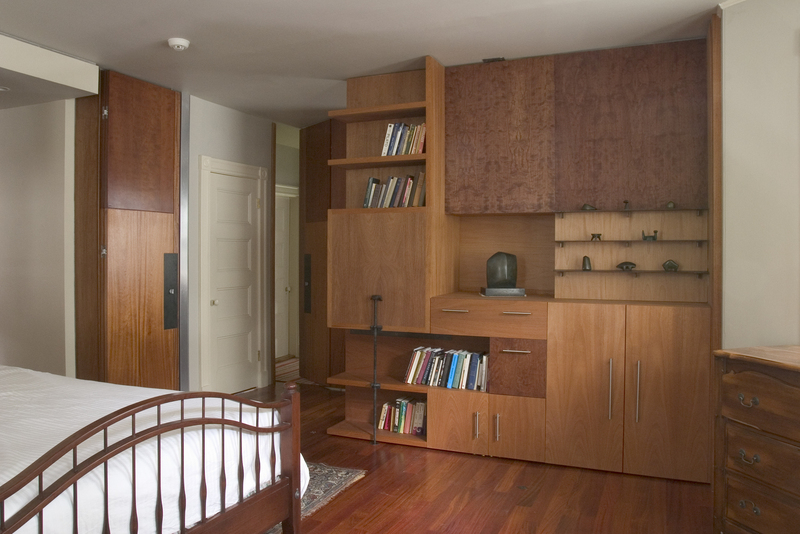 The panels consist of five pieces of milled mahogany with cherry accents. Four of the pieces are flat panels and are paired into two groups that hinge together. When one of the paired panels is locked in place, the other panel acts as a door. The fifth is a large double-sided bookshelf. While serving to change the spatial condition of the master suite, the bookshelf also serves to house much of the client’s book collection and displays a collection of sculpture by Peter Haines. 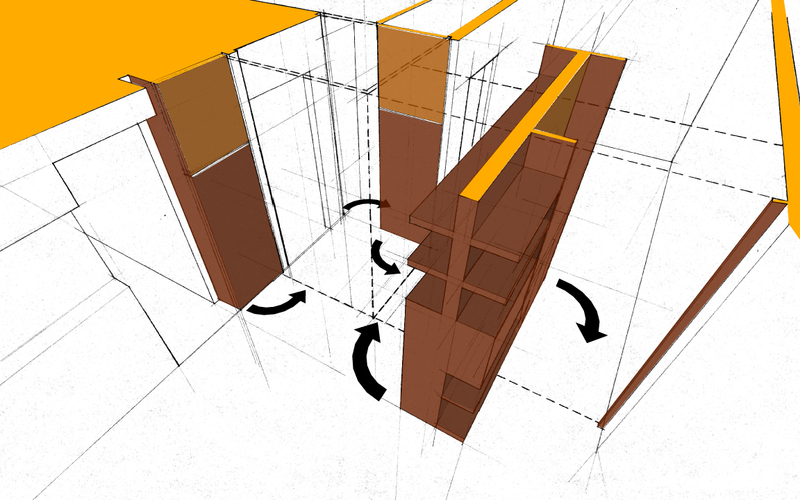 The bookshelf rotates on a central pivot, allowing a smooth operation of an otherwise cumbersome piece. 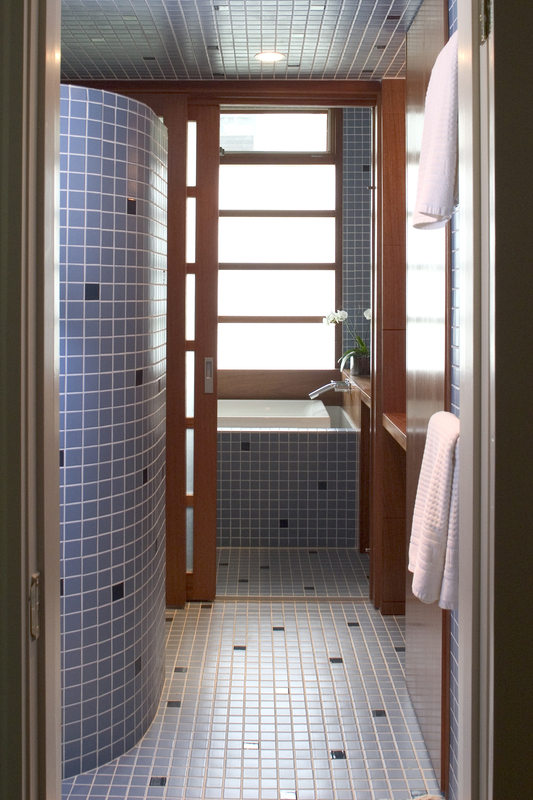 The bathroom was redesigned by combining two small bathrooms, one full and one half, into a divisible master bath. 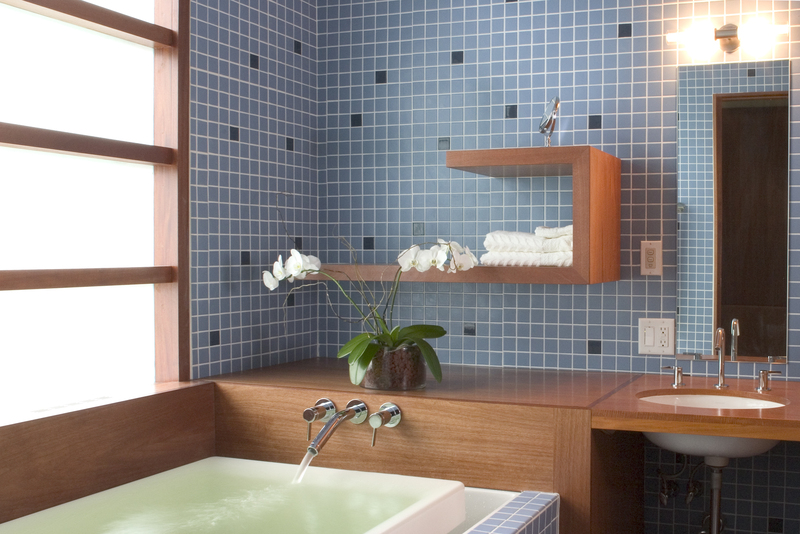 The central concept for the bathroom was the large soaking tub, which was to remain as a private experience even when guests may share the rest of the bathroom. The bathroom is therefore divided into two areas, a functional area including the shower, toilet, sink, and washer/dryer and a private bath area, which has the soaking tub and a sink. The soaking tub is celebrated by being placed adjacent to the exterior of the house next to a new large window. 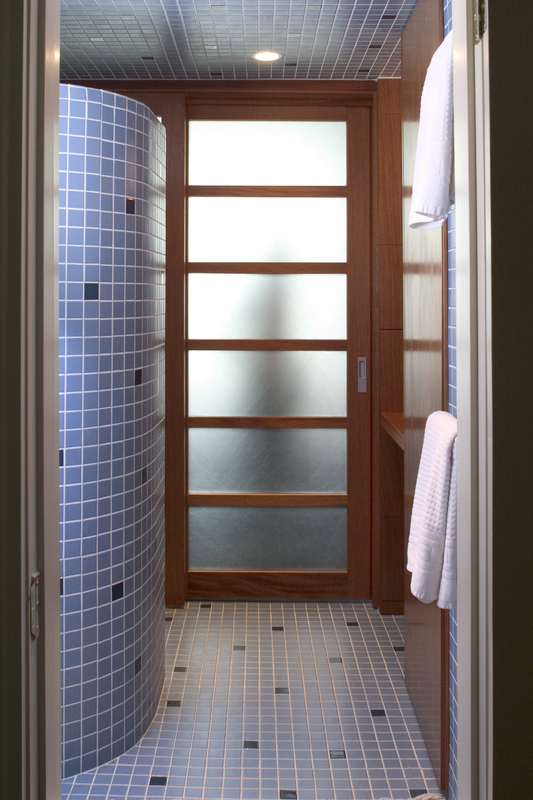 The mahogany window and dividing door are glazed in glass laminated around rice paper that creates privacy between the bathing areas but allows light to penetrate deep into the bathroom. The bathroom is fully tiled and accented with mahogany millwork. Additional work as part of the renovation includes a his and her master closet with respective changing areas and minor work to the master bedroom and office. 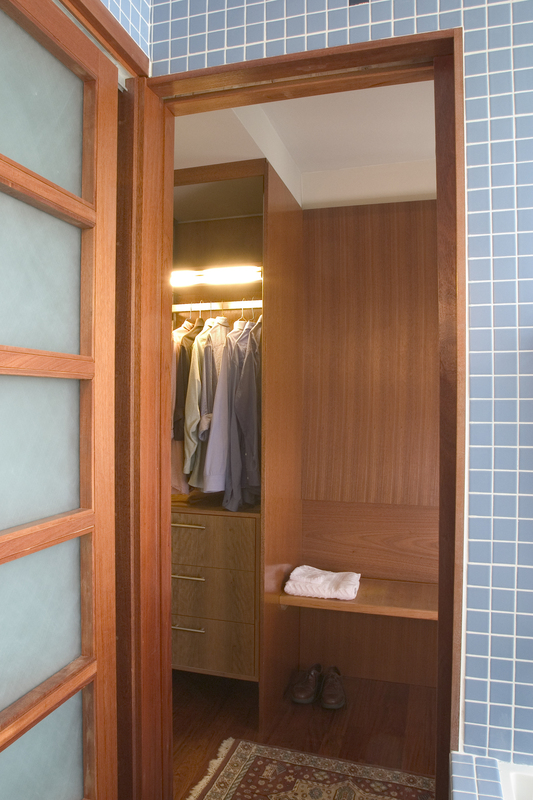 The closet area is composed of large built in closets. 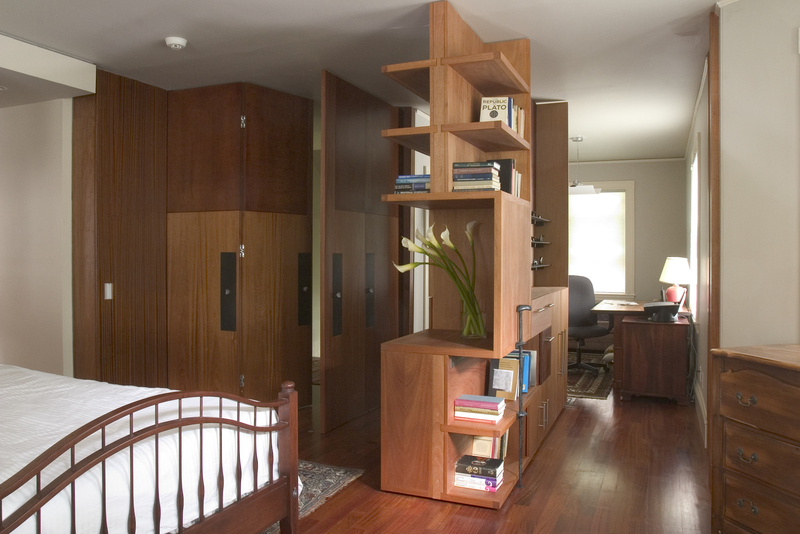 The closets consist of a steel frame, which supports cherry drawers and shelves. 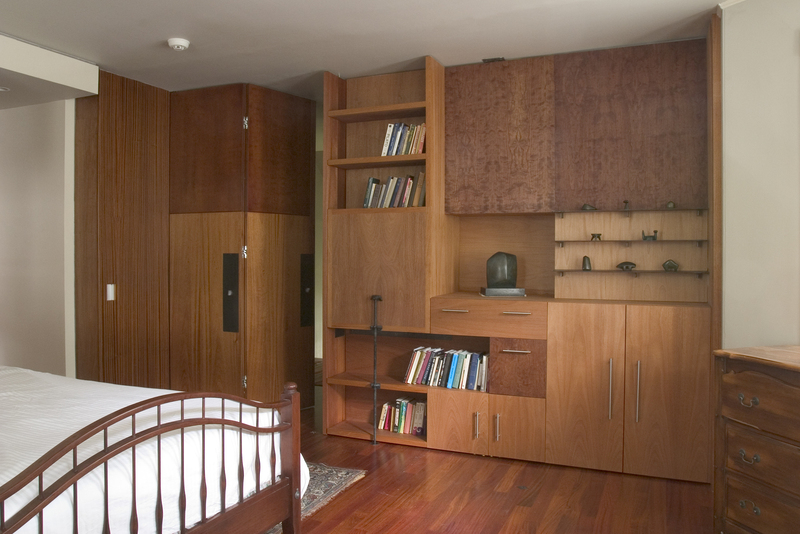 The steel frame, which also serves as clothing rods, is then enclosed in mahogany doors to finish off the room. A built in bed board has been added to the master bedroom, setting a place for the bed and providing a spot to display artwork. The flexible nature of this design combined with numerous built in elements encourages the maximum use of a minimal amount of space. Enabled by an adventurous, thoughtful, and tasteful client, this project successfully mitigates needs for various functions without the addition of extra space. The Newton Master Suite Renovation provides an innovative master suite design that meets the client’s needs with a flexible system that allows them to vary their private domain.